In the future, some kind of catastrophe – planned or otherwise - has befallen Earth’s once great natural environments. All that’s left is a handful of domed preserves, drifting through the solar system attached like glistening seed pods to huge skeletal space freighters. After the order arrives to jettison the forests, blow them up with nuclear bombs, and return the ships to commercial use, most of the crew are jubilant about the prospects for returning home. But one ecologically-minded astronaut – the begowned, plant-loving hippy Freeman Lowell – decides he isn’t going to stand for this. Before very long he’s killed the other crewmembers, taken the ship off on a white-knuckle ride through Saturn’s rings, and begun bonding with the maintenance drones. Lowell is eventually forced to sacrifice himself to save the last forest, itself left in the care of the final fully-functioning drone. The film closes with touching images of the robot tending the garden, continuing the task that humans couldn’t be trusted not to screw up. Despite these problems I love Silent Running unreservedly. Emerging at the tail-end of the Apollo era, it’s as much a part of the early seventies as After the Goldrush, and should be seen in that context. When I saw it for the first time, at the other end of the seventies, it slotted neatly into place as the missing jigsaw piece tieing together the other big SF films of the last decade, of which it seemed to share a consensus view about the way the future was going to look. It had the plausible industrial design of 2001: A Space Odyssey: the huge, grey-clad spaceships sliding ponderously past the camera, the control rooms filled with complex navigational hardware and shuffling readouts, the emphasis on artificial intelligence as an essential component of our spacefaring future. It had the shuffling, bipedal robots that I had glimpsed in background scenes in Star Wars. It had the downbeat, working stiffs in space aesthetic of Dark Star (prefiguring Alien, which I didn’t see until several years later). Above all else, and for all its moments of humour, it was terribly, terribly sad: things just didn’t go well for Freeman Lowell or anyone around him. Stars Wars changed matters, of course, but the one thing you didn’t go to seventies SF for was a happy ending. The connection with 2001 ran deeper than I appreciated at the time. The director, Douglas Trumbull, had led the effects team on that film. One of the key differences between Clarke’s novel and the film is that in the book the Discovery travels to Saturn, not Jupiter. In fact the change to Saturn was Kubrick’s idea – he was keen on the idea of showing the rings, and having the Discovery fly among them. Clarke rewrote the story accordingly. But Trumbull’s team, already under pressure with existing work, “went ape” and vetoed the change, which is why it remains Jupiter in the film. It’s tempting to view the Saturn sequences in Silent Running as Trumbull returning to do justice to the ringed planet, but in truth the Saturn encounter, while dramatic, is not even the most impressive element in the film, and doesn’t really improve upon anything in Kubrick’s masterpiece. While some of the spaceship effects are good, by far the best things about Silent Running are the convincingly rendered interior shots – the domes and vast, mechanized cargo bays - and the marvellously realised drones, all of which were operated by amputee actors. Comparisons with 2001 rather miss the point, though. The earlier film was meticulously plotted and designed, with a logical basis for everything that occurs or is shown, whereas Silent Running functions better as a dreamily rationalised eco-parable. It’s all about conservation, ultimately, and the lengths one could or should go to in order to protect something utterly irreplaceable. The film has been accused of being morally dubious, but I don’t go along with that. We’re not invited to sympathise with Lowell’s actions – even he seems rightfully appalled by what he has done – but merely to accept that, given the tremendous stakes, a good man might act in this way. After he has killed his colleagues, Lowell touches his conservation pledge, as if desperately trying to reassure himself that he has done the right thing. This is not a man with a clear conscience. And while he does end up saving one of the forests, he doesn’t save himself. In fact Bruce Dern succeeds in portraying Lowell as at least mildly unhinged from the very outset. Still, each time I watch the film I can’t help but put myself in Lowell’s position and wonder if what he does is in any way justifiable. One could argue that the stakes are artificially high – that in the real world it would never come down to a simple choice between murder and losing the last forest in existence. 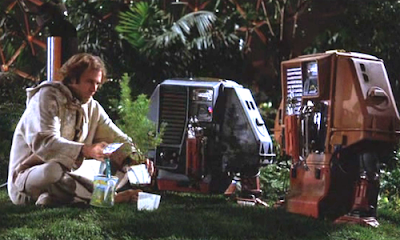 But setting up that kind of duality is one of the things that science fiction does rather well, and Silent Running does it as effectively as any SF film I know. One final point: early in the film we’re told that the domed preserves were created around the turn of the century. Later, we learn that Lowell has been involved with the project for nine years, and was there from the beginning – thus neatly placing the action around 2009 or 2010. Thankfully, of course, in the enlightened world of the real 2010, we don’t have to worry about anyone cutting down forests any more, or the Earth’s climate going bananas. I don't think this film could have had anything but a profound impact on any fan growing up in the '70s/'80s. It certainly has cast a long shadow over my mindset, and look forward to sharing it with my own kids at some point. Despite Lowell's violence, I always felt there was a profound gentleness in Dern's performance. When I was a kid this film made me cry - I couldn't bear the little abandoned robots at the end. It stuck in my head for its bleakness. Interestingly, Trumbull's original story for Silent Running was even dreamier than the movie ended up ... and had a finale that incorporated a trippy encounter with an alien spacecraft. I agree that Dern does a great job expressing the duality that sets Silent Running apart from lesser films. People often ask for predictions that SF got right. Along with the usual things, I always include this as a warning about the dangers of environmental extremism. There is no environmental extremism. Christians kill people for their beliefs, communists kill people for their beliefs, libertarians, anti-abortionists, fascists, muslims, anarchists, racists, jews, patriots, pretty much everyone EXCEPT environmentalists commit murder for their causes. You are the Muhammad Ali of being wrong. Silent Running is a beautiful little film, and doesn't deserve to be overshadowed the way it is by its flashier cousins. Tried watching this film once more, the other day (it's on youtube! ), and realised that, although it is a great film, it did not "age" that well. Same goes for 2001. I wonder how I would see the brilliant 'Moon' in a few decades. I only discovered Silent Running a few years ago via the magic of Netflix and I immediately fell in love. I wanted to be on board the ship, swimming in those pools, tending those plants, playing poker with those drones, killing those bad corporate stooges... well maybe not the last bit, but you get the idea. But what really sold me on it was Joan Baez! What wonderful music, perfect for the film, perfect for the times, perfect for the sensibility. I loved it so much I never really thought about the implausibilities though. I think I still really approach movies leading with my chin, maybe. And this one delivered such a soft tap. Hello, where can this be found on Netflix? I searched for "Silent Running" and got no results. Is it under another search? Or has it suffered the fate of anything any good these days, and has become pay-per-view? Thx, this movie sounds cool! Karen: I think children identify very strongly with the robots. I remember being very upset about the one that gets blown off into space. Kate: I love the Joan Baez music! It's certainly a great looking film but I'm afraid it falls into the category of "Utterly Stupid Dystopias" for me. Completely nonsensical plot, and as you point out, a botanist who doesn't know plants need sunlight. I watched Silent Running for the first time on Netflix a few weeks ago (Like a few others, I see!) I thought there was some good ideas in it, but I just couldn't take the plot seriously. Why not just collect seeds and store them somewhere, like the Svalbard seed vault instead? Soylent Green is still my favorite "eco catastrophe" movie. I think it has more of a bite and the ending always makes me slightly depressed afterwords. I would love to see John Brunner's book The Sheep Look Up turned into a movie. I think it has more relevance today than when it was written in the 70's. The plot doesn't make much sense, as I think I say in my piece, but I suspect I fell in love with the film at a point when my critical deflector shields had yet to form. If I came to it cold now, I doubt I'd see it similarly. Oddly enough I've never seen Soylent Green. This was the first fim to make me cry! Can you believe that we send SIX manned missions to the moon over the course of just FOUR years (1969-1972) ... and FIFTY years later have yet to even send ONE manned mission beyond earth orbit? As for the film, I saw it when it was first released. I was 12 and found it profoundly disappointing, especially given the description on the movie poster: "Amazing companions on an incredible adventure ... that journeys beyond imagination!" Still, a number of images stuck with me, not the least of which was Dern, already a veteran of many Westerns, playing poker with the drones. In 1959 the Avro Arrow fighter aircraft project was cancelled by the Canadian Government. All prototypes, tooling, and technical data were ordered destroyed. There was no reason to destroy all of this work and not even leave a prototype that could have been placed in a museum, but politicians at the time made that decision out of an irrational fear that Russian spies would somehow gain access to this technical data and steal secrets. I agree that there are many flaws in the plot and the science, but the idea that politicians would order the domes destroyed actually makes sense to us poor Americans who see politicians destroying books that teach evolution and denying all of the science of global warming. As long as the domes exists, there would be some faction (inevitable referred to as radical environmentalists) wishing to return the plants to Earth. Destruction would put an end to that argument forever.